The D112/C Harmonica Microphone is a specialty mic with the look of traditional harmonica mics, but with modern features and a dynamic mic element. It provides the classic "blues" sound many harp players are looking for. The top of the mic has finger grooves to make is easy to hold securely, while the bottom of the the mic has a conveniently located level control knob. The permanently attached cord ends in a traditional 1/4" plug. The D112/C mic comes with a built-in level control, permanently attached cable with 1/4" plug, D112/C Harmonica Microphone The Superlux D112/C is a dynamic microphonespecifically designed for harmonica players.It fits comfortably in your hand and is easy to hold with a harmonica while performing. A detented volume control is perfectly placed underneath the mic, that is easy to access while playing. The tailored frequency response is ideal for reproducing that classic blues sound many harp players are looking for. The D112/C has a built in 20 foot cable and is designed with a high impedance ¼" phone output connector that easily connects to a guitar amplifier or other high impedance input. 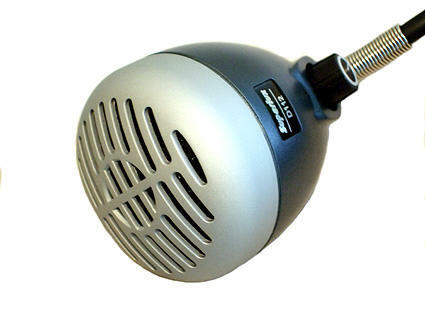 SPECIFICATIONS Element Dynamic Polar Pattern Omni-directional Frequency response 100-6000 Hz Sensitivity -48dB/V (4mV/Pa) at 1000 Hz Impedance High impedance, unbalanced Minimum Load Impedance 1000 ohm Cable 20 foot cable, 1/4" M Phone connector Weight 22.93 oz. "So.... If you wanna play that Chicago blues harmonica music like you been listenin' too take your diatonic harmonica, plug the Superlux mic into your guitar amp and blow dem devil blues away."